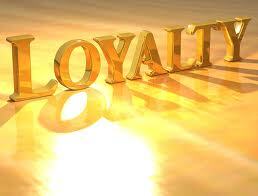 True loyalty, true fidelity, lasts, no matter what. The term ‘high fidelity’ is used in the music industry, it refers to a sound system that produces high fidelity. It means to reproduce a sound that is faithful to that of the original performance as possibly as can be reproduced. This degree of fidelity, or faithfulness, is difficult to achieve, in life as well as in sound systems. Oh that we could all be ‘high fidelity’ in our walk with Our Lord and Our Friend. Even if we can’t be a faithful reproduction, we all should aspire to be, a faithful follower, in the way in which we live. God gave us His best, ours is to give back to Him our best in high fidelity.